The 17th century is the heart of what historians refer to as the Early Modern Period. It was modern in the sense that new innovations, from the printing press to the compass, from the first joint-stock corporations to the latest sailing-ship designs, were ushering in a newly globalized perspective in the countries of Europe in particular. Yet it was indeed still early in the day for modernity, and the latest trends in life and thought still sat uneasily beside the stubborn relics of the Middle Ages. Nowhere is this more evident than in the “natural philosophy” of the day, the set of disciplines that would, slowly and painfully, evolve into modern science. Even as natural philosophers began to probe the world around them using methods of logic and controlled experimentation not that out of keeping with the science of today, many of them were still obsessed as well with humors and alchemy, astrology and numerology. The classic example of the conflicted Early Modern natural philosopher must always be Sir Isaac Newton, who was laying down the groundwork of modern calculus and physics at the same time that he searched unceasingly for a mystical “philosopher’s stone” that would transmute base metals into gold. In the mind of Newton as in Early Modern society in general, there was no clear demarcation between physics and metaphysics. This conflation of the practical and the mystical in European thought was to a large degree courtesy of ancient Egypt. During or around the 1st century AD, a group of anonymous scholars had compiled a Greek translation of much older Egyptian writings, covering a huge range of subjects, from relatively grounded inquiries into natural phenomena to expansive religious and spiritual meditations. For unknown reasons, either the translators or the transcribers who followed them attributed it all to a single long-dead sage known as Hermes Trismegistus: “Hermes the Thrice-Great.” When the so-called “Hermetica” made its way to Europe from Constantinople along with many other ancient writings a millennium later, it was embraced wholeheartedly by European thinkers. Hermes was often given the status of a prophet, and his writings were taken as the key to a theory of everything that would unite humanity’s understandings of the physical and spiritual realms. In 1543, for example, when Nicolaus Copernicus published his theory of heliocentrism, he mounted a preemptive defense against charges of apostasy by noting that the divine Hermes too had claimed that the earth actually orbited the sun, not the other way around. The Hermetica’s origins in ancient Egypt did much to fuel the growing European fascination with that long-dead culture, even as the other-worldly Pyramids of Giza became the embodiment of this most alluringly mysterious of all ancient civilizations. Much of the mystery was down to the fact that Egyptian culture was literally unreadable. While ancient Greece and Rome could be studied by reading the words of their own peoples, the hieroglyphs found on Egyptian monuments and artifacts remained a closed book. The closest scholars could come to the culture was to read what outsiders writing in languages they could understand, such as Herodotus, had written about Pharaonic Egypt while it still existed. Some of the more mystically-minded scholars believed that Egyptian hieroglyphs could never be understood, that they represented a form of mystical communion unavailable to the more spiritually debased age of the 17th century. The foremost early exemplar of the impact which Hermeticism had on the study of ancient Egypt is the career of the German Jesuit Athanasius Kircher, who is still sometimes called “the father of Egyptology.” Born in Würzburg in 1602, Kircher was driven to Rome by the chaos of the Thirty Years’ War. There he established a reputation as the foremost Catholic polymath of his time, with a special interest in Egyptian hieroglyphs, which he saw as a means of coming closer to the divine truths embedded in the Hermetica. “Hermes Trigmegistus,” he wrote, “first instituted the hieroglyphs, thus becoming the prince and parent of all Egyptian theology and philosophy, was the first and most ancient among the Egyptians, and rightly thought of divine things; and engraved his opinion for all eternity on lasting stones and huge rocks.” Kircher apparently never visited Egypt himself, but he had no shortage of research materials. Many ancient Egyptian obelisks and other artifacts with hieroglyphic inscriptions had been sent to Rome during the days of empire, and Kircher, who served as curator of the Collegio Romano where many of them had been collected, could study them all to his heart’s content. Kircher claimed, correctly, that Coptic, a still-living if dwindling language in the Egypt of his own time — it has since been almost entirely superseded by Arabic — was the immediate descendant of the language that had been spoken there during ancient times. Yet he failed to make the leap from there to the assumption, seemingly obvious to our sensibilities, that hieroglyphic writing was merely an earlier method of encoding the spoken language than the Coptic script he knew. He rather saw the older form of writing as something fundamentally different from everyday language, a higher medium of communication. He further claimed that he had deciphered said medium, publishing the details of his research in four thick volumes. Even at the time, his claims were greeted with considerable skepticism outside the Vatican, especially after some wag sent him an alleged ancient document to translate, full of random combinations of hieroglyphs, and he promptly produced a florid message in Latin. Later centuries would indeed show that Kircher had understood virtually nothing of Egyptian hieroglyphic writing. He translated the inscription on one obelisk as, “The protection of Osiris against the violence of Typho must be elicited according to the proper rites and ceremonies by sacrifices and by appeal to the tutelary Genii of the triple world, in order to ensure the enjoyment of the prosperity customarily given by the Nile against the violence of the enemy Typho.” Actually, it was just a list of names. But even as Athanasius Kircher was approaching the nascent discipline of Egyptology as an essentially metaphysical pursuit, others were applying more grounded techniques that smack of modern science. The earliest and perhaps most remarkable of these was an Englishman named John Greaves, who was seeking to understand ancient Egypt in an entirely different way at the same time that Kircher was communing with the spirit of Hermes the Thrice-Great. Greaves was born the very same year as Kircher. The son of a provincial schoolteacher, he arrived in Oxford at age 15, where he received an education that must strike us, the products of the Age of the Specialist, as impossibly diverse: Greek, Latin, philosophy, literature, mathematics, astronomy. Yet in at least one way, Greaves’s mindset was indubitably modern: he loved to put numbers onto things, loved to quantify the world around him. He plotted the altitude and distance of stars, the latitude and longitude of cities; he measured the dimensions of St. Peter’s Basilica and the circumference of the walls around Lucca. In 1637, now well-established as a professor of geometry and astronomy, he won a commission from the Archbishop of Canterbury to “travel into the eastern parts of the world, to obtain books , especially in the Arabic language.” Now 35 years old, Greaves was an ambitious scholar, self-confident enough to make observations that sometimes went against the grain of tradition. He would parlay his bibliophilic excursion into the first reasonably thorough and — we can dare to say it — scientific examination of a Pyramid of Giza. After long sojourns in Rome, Padua, Florence, Constantinople, and Rhodes, Greaves arrived in Alexandria at the beginning of 1639. During the four or five months he spent there, seeking out rare manuscripts for his patron in the erstwhile home of the most famous library the world has ever known, he also found time to travel overland to Cairo and the Giza Plateau. He arrived complete with a veritable treasure chest of measuring equipment; he wasn’t after mystical enlightenment, but rather hard data. So, like the tourists still do today, he and two companions made the “gentle and easy ascent” from the Nile Valley to the Giza Plateau, observing how the geology of the latter gives the pyramids “a permanent and stable support.” Soon they stood before what Greaves considered the “fairest” of the pyramids, as well as the oldest and the biggest: the Pyramid of Khufu. Much more interesting was the question of the Pyramid of Khufu’s height. Being thoroughly familiar with all of the ancient texts that touched on the pyramids, Greaves knew well the story of how Thales of Miletus, who was regarded by Aristotle himself as the first of the great Greek philosophers, reputedly found the pyramid’s height at some time around 600 BC, arguably inventing the mathematical concept of ratio in the process. 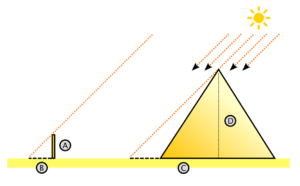 Thales, as the story went, planted a stick in the ground on the Giza Plateau, then recorded the exact moment when the stick’s shadow was the same length as the stick itself. The next day at the same moment, he measured the length of the pyramid’s shadow and added to that figure half of the length of its base — which would have obscured part of its shadow — to arrive at the pyramid’s height. This story of Thales at the Pyramid of Khufu seemed to contradict another oft-repeated ancient claim that was frequently given a mystical significance by the people of Greaves’s time: that the pyramids cast no shadow at all. This, Greaves now observed, was definitely untrue. Even at noon, he could observe a shadow. As an astronomer, however, he recognized that he — and presumably Thales — had chosen precisely the correct time of year to come if they wished to see such a thing. For almost three quarters of the year, the pyramid’s shadow at noon wouldn’t be long enough to exceed the width of its base, giving the illusion that it cast no shadow at all. In at least one sense, then, the Thales story checked out, but that’s not to say that Greaves found it overly credible on the whole. Unusually for a time when most ancient philosophers were regarded as virtual infallible demigods, he approached anecdotes like this one with skepticism; indeed, he decidedly relished in pointing out the ancients’ errors of fact and measurement. Only the merest fragments of Thales’s own writings survived, meaning that his purported accomplishments — this one among them — must be viewed entirely through the eyes of those ancients who came after and wrote about him. Tellingly, none of the several sources which described Thales’s experiment on the Giza Plateau deigned to say what the actual height he measured was. Even more tellingly, no one ever seemed to have succeeded in replicating it. So, Greaves wasn’t inclined to give Thales the benefit of much doubt. He saw the shadow-measuring technique as “a way at the best, by reason of the faintness and scattering of the extremity of the shadow in so great an altitude, uncertain and subject unto error.” As a modern natural philosopher, he was sure that he could do better. Greaves believed the Pyramid of Khufu to be made from four equilateral triangles — i.e., triangles in which all three sides are of equal length — leaning inward so that their upper points all met at the apex of the structure. The origin of this belief is hard to pinpoint. He may have derived it from Herodotus’s statement that the height of the pyramid was the same as the length of its base. Even a fairly cursory examination would have revealed this to be incorrect, but Greaves may have concluded that what Herodotus really meant to say was that the distance up one of its lateral edges was the same as the length of its base. At any rate, all of the calculations he now proceeded to make were predicated on this assumption. Having completed their observations at the base of the pyramid, Greaves and his companions now experienced something no tourist of today can even dream of: a hair-raising scramble up one of its sides to its very peak. By the time Greaves arrived in Egypt, the smooth casing had been completely removed from the pyramid, thus making such an excursion possible. Still, it must have been extraordinarily taxing. Some of the jumbled “stair steps” they had to navigate were almost 4 feet (1.2 meters) in height, and they counted 207 of them in all. At last they arrived at the top, “which ends not in a point, as mathematical Pyramids do, but in a little flat or square”; the pyramid, in other words, appeared to have had its very tip lopped off. One can scarcely imagine the vista that must have greeted their eyes from their precarious perch, high above the desert sand. Proclus, one of the last Greek classical philosophers, had claimed in circa AD 450 that ancient Egyptian priests had once stood upon this perch and made observations of the firmament. These resulted in the 365-day calendar that still remained with humanity, in only modestly adjusted form, in Greaves’s day, as it still does in ours. Greaves and his companions scrambled back down to ground level. Now awaited the next phase of their investigations: to go inside the Pyramid of Khufu, the only one of the three with a known, accessible entrance. 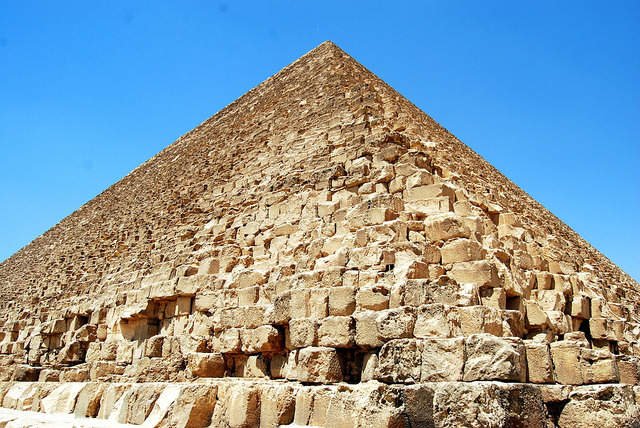 They were by no means the first Europeans to do so; a slow trickle of adventurers and wealthy curiosity seekers had been making the trek to the Giza Plateau and going inside the Pyramid of Khufu since the time of the Crusades. Nor was there any reason to expect treasures inside. Greaves knew that the pyramid was a tomb, having no time for any of the more fanciful or mystical explanations for its existence, and also knew that it had long since been emptied of its contents. Nevertheless, he was conscious, as modern tourists still are today, of the transgression he was about to commit. He thought about the ancients’ “reverend and awful regard, mixed with superstition, in not presuming to enter those chambers of death, which religion and devotion had consecrated to the rest and quiet of the dead.” While he would not be the first European to enter this realm of the dead, he would be the first to write in detail about what lay inside. Greaves and his companions entered the pyramid from a forbidding opening located 38 feet (11.6 meters) above the ground on its north face, reached via a convenient mound of sand piled up against the pyramid’s side; this may have been man-made or may have been a natural result of the winds that swept across the plateau. Wishing to test an anecdote of the Roman essayist Plutarch, Greaves fired off a musket just inside the entrance, causing an eerie echo which continued for quite some time up and down the passage they would soon have to follow. They must truly have felt like lost souls entering the underworld as they made their way down this steeply-declining passage, lit only by the fast-receding sunlight shining in from the entrance behind them and by the lit tapers they carried. Greaves noticed in the passage “the labour of an exquisite hand, as appears by the smoothness and evenness of the work, and by the close knitting of the joints.” Some 90 feet (27 meters) inside, it contracted itself vertically, forcing them to “serpent-like creep upon our bellies” for some nine feet (2.5 meters), holding their tapers aloft before them as they crawled to avoid the unpleasant prospect of a blackout in these Stygian depths. The straitened section of passage opened out slightly into an “obscure and broken” one, stretching another 89 feet (27.1 meters) before dead-ending in a jumble of rubble. It showed none of the craftsmanship Greaves had remarked earlier; he theorized that it might have been dug out by treasure seekers rather than by the original builders of the pyramid. This section of passage had become the abode of bats, “and those so ugly, and of so large a size, exceeding a foot in length, that I have not elsewhere seen the like.” We can imagine the creatures, disturbed by the men’s flaming tapers, flapping wildly around their faces in the dark and narrow space. Thankfully, there was another way out besides the way the men had come. Adjacent to where the straitened section of passage ended was a “steep and massy stone,” almost ten feet (3 meters) in height. Scrambling up its side, they arrived at what Greaves dubbed the “first gallery,” an ascending passage of a much more finished character, built of “smooth and polished marble, and, where not smeared with filth, appearing of a white and alabaster color.” One of Greaves’s companions was a Venetian who knew something about stonework. He was very impressed with the craftsmanship. At the apparent top of this first gallery, just where it appeared to open up further, a hole was cut out of the wall, leading unto another narrow passage which ran horizontally. Just inside it was what appeared to be a well — made, Greaves noted, using much the same techniques as the more recently dug ones he had seen around Alexandria. It was somewhat over three feet (.9 meters) across, with holes for climbing cut into its sides. Could this lead down to the nether region so cryptically and tantalizingly described by Herodotus, where Khufu’s sepulchral chamber supposedly lay as an island on an underground sea? Adventurous and dexterous scholar though he was, Greaves didn’t dare attempt a descent to find out. Instead he lit a rag on fire and dropped it down the well; it fell only a short distance. Using a measuring line, he estimated the obstruction on which it had landed to begin only about twenty feet (6 meters) below. Whether that was the well’s true bottom, or whether it was merely stopped up with debris, must remain an open question. The same passage — blessedly horizontal! — continued for about 125 feet (38 meters) beyond the well, the stones once again “very massy and exquisitely joined.” It terminated in the first real chamber the men had encountered, an “arched vault” with walls “plastered over with lime,” about 20 feet (6 meters) long, 17 feet (5 meters) wide, and 15 feet (4.5 meters) high. The chamber was full of rancid garbage, overpowering any relief the men might have felt at being in such a relatively large space at last and rather cutting short their stay. But Greaves did have time to notice what appeared to be the beginning of another passage in one wall, now collapsed either accidentally or deliberately. 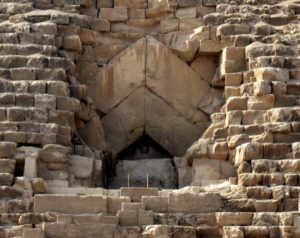 Could this be the secret passage which, according to some legends, had allowed priests to move between the Sphinx and the pyramid? Or was it merely a niche for the placement of idols or ornaments? Climbing the length of the gallery — a treacherous endeavor, given the steep angle of ascent and the smooth, slick flooring — the men arrived at a closet-like chamber constructed on a level, 7 feet (2.1 meters) in length, 3.5 feet (1.1 meters) in width, and 10 feet (3 meters) in height. On the side walls of the chamber were six small niches, while an opening in the far wall was partially blocked by a great slab of “red-speckled marble, wedged into mortises on either side,” leaving a gap of three feet (.9 meters) between stone and floor, two feet (.6 meters) between stone and ceiling. The men nervously crawled under it, to emerge in another closet identical to the one they had just left in almost every detail. There was no slab in the opening leading out of this chamber. But above the opening was what Greaves believed to be the first bit of writing or engraving he had seen in or on the pyramid: five vertical lines carved next to one another. This rich and spacious chamber, in which art may seem to have contended with nature, the curious work being not inferior to the rich materials, stands as it were in the heart and center of the Pyramid, equidistant from all the sides, and almost in the midst between the basis and the top. The floor, the sides, the roof of it, are all made of vast and exquisite tables of Thebaick marble, which, if they were not veiled and obscured by the steam of tapers, would appear glittering and shining. From the top of it descending to the bottom there are but six ranges of stone, all of which being respectively sized to an equal height, very gracefully in one and the same altitude run round the room. The stones, which cover this place, are of a strange and stupendous length, like so many huge beams lying flat, and traversing the room, and withall supporting that infinite mass and weight of the Pyramid above. It would have been obvious from the stately magnificence of the space that the men had reached the true heart of the pyramid even had it not been for the sarcophagus standing near the center of the chamber — the one tangible remainder of the treasures that must once have been here. The lid had been removed and the pharaoh’s mummy was, naturally, long gone, but what remained was still impressive. It must have been carved, Greaves believed, from a single slab of marble; it rang like a bell when he tapped it. He chiselled a small chunk from its surface, discovering it to be speckled in black, white, and red, such that it must have sparkled brilliantly in full lighting; his Venetian friend insisted that it must have come from the legendary quarries on Mount Sinai. Taking the sarcophagus’s proportions, as he was always so wont to do, Greaves mused that the people of antiquity must have been roughly the same size as the people of his own time, not the giants some still claimed them to have been. The virtual perfection of the chamber, untouched by the passing of untold millennia, was marred only by a hole dug into the floor near the sarcophagus. This briefly raised the hope in Greaves that there might be a second passage leading out, but it proved not to go anywhere. They had reached the end of the line, it seemed; there was nothing for it but to return the way they had come. Three hours after entering, the three men emerged again “into the light and sun,” exhausted, filthy, and a little shaken by their intimate communion with such an inconceivably ancient structure. In at least one sense, however, Greaves’s brief observations of the Pyramid of Khafre are extraordinarily interesting. “The stones are of colour white,” he wrote, “nothing so great and vast as those of the first and fairest Pyramid; the sides rise not with degrees like that, but are all of them plain and smooth, the whole fabrick (except where it is opposed to the south) seeming very entire, free from any deformed ruptures or breaches.” It would seem, in other words, that the Pyramid of Khafre’s smooth casing was still intact on at least three sides at this relatively late date of 1639. That Greaves should have found this intact pyramid to be so aesthetically inferior to its naked sibling is odd — but, having never seen what he saw, we can’t say much more about it than that. 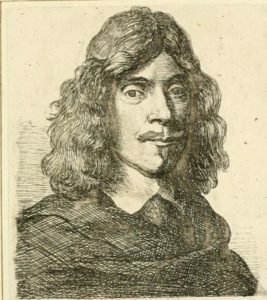 After departing Egypt and sojourning once again in Italy, Greaves finally returned to England in the summer of 1640, three years after he had departed. He didn’t publish an account of his adventures on the Giza Plateau until 1646, in a manuscript with the delightful title of Pyramidographia. Alongside his personal measurements and observations, he theorized therein, as best he could from scant data, about when the pyramids were built. From a thorough and thoughtful comparison of Greek, Roman, Arabic, and Biblical sources, he surmised that Khufu had reigned and built his pyramid around 1266 BC. Like everyone who has ever visited the Giza Plateau, dating back to the time of Herodotus and doubtless long before, Greaves couldn’t help but wonder how such an ancient, presumably primitive culture could have erected such monuments. All that existed in the historical record was rank speculation. As we saw in the last chapter, Herodotus claimed the pyramids had been built by using some vague “machine” to lift the blocks into place. Diodorus and Pliny parroted a legend that the Egyptians had piled up huge mounds of salt and/or sand to use as building platforms; when the Nile overflowed its banks to come quite close to the edge of the Giza Plateau, which it did almost every year prior to the construction of the modern Aswan High Dam in the 1960s, it dissolved and carried these mounds away. In this respect, these ancient writers were, one might say, just typical tourists. Not only does everyone who visits the pyramids wonder how they were built, everyone seems compelled to proffer an explanation. Thus, having rejected the accounts of all of the classical texts as impossible, Greaves proposed his own theory: “First they made a large and spacious tower in the midst reaching to the top; to the sides of this tower I conceive the rest of the building to have been applied piece after piece, like so many buttresses or supporters, still lessoning in height, till at last they came to the lowermost degree.” Greaves’s “tower” has much in common with classical pyramid-building dei ex machina in that it raises rather more questions than it answers. Suffice to say that the debate over how the pyramids were built wouldn’t be settled in Greaves’s lifetime, nor in many lifetimes thereafter. Over the course of his scholarly career, Greaves wrote on many other subjects unrelated to the pyramids, from the systems of weights and measures in use during ancient times to the etymologies of Arabic, continuing to publish even after Oliver Cromwell’s Roundheads cast him out of his professorship at Oxford. He died in 1652, doubtless regarding his work on the pyramids as but one small part of his intellectual legacy. Over the century and a half following Greaves’s visit, quite a number of travelers published their own observations of the Giza Plateau. The Frenchman Benoît de Maillet, who served as his country’s consul-general in Egypt from 1692 to 1708, spent more time inside the Pyramid of Khufu than any European to date; he claimed to have entered it more than forty times over those years. By the time he arrived in Cairo, the Pyramid of Khafre had been stripped of its smooth casing everywhere but at the very top, as it remains today. It would therefore seem that this final act of desecration was committed by the inhabitants of Cairo at some point during the mid- to late-1600s. Maillet and others made diagrams and measurements of their own on the Giza Plateau, in many cases more accurately than John Greaves had managed. Yet none of them contrived a way inside the Pyramid of Khafre or Menkaure, nor did they make public any earth-shattering new discoveries inside the Pyramid of Khufu. The only man to come remotely close to such a thing was the Englishman Nathaniel Davison. 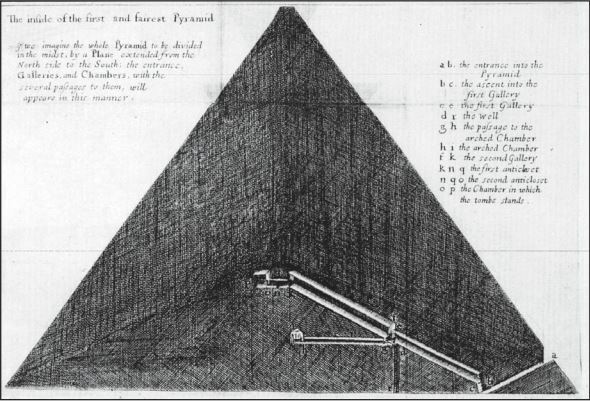 In 1765, pursuing an odd echo he had noticed near the central burial chamber, as well as rumors he had gleaned from the Egyptians who hung about the Giza Plateau even then to serve curious European visitors, he found another chamber above the burial chamber, accessible via a breach in the very top of the wall at the end of what Greaves called the second gallery. The hidden chamber’s walls, floor, and ceiling were unfinished, leading Davison to theorize that the space had been hollowed out to relieve some of the pressure that thousands of tons of rock must make on the roof and walls of the burial chamber — a sophisticated bit of structural engineering indeed for an allegedly primitive people. Conjecture of this sort was all that the visitors could manage. Despite another 150 years of speculation and documentation of the pyramids’ obvious physical attributes, little more of real import was known about them or the culture that had built them at the end of the 18th century than during John Greaves’s time. But at last, an accidental confluence of geopolitical developments was about to usher in the first great era of concentrated discovery across all of Egypt — and not least on the Giza Plateau. 7 Comments for "Chapter 2: The Mystic and the Measurer"
Giza is very familiar ground to me, so I’m afraid I won’t get as much out of this series of posts as I do out of Filfre, which has filled gaping holes in my knowledge of computer game history. But you discuss the pyramid well, as usual, and I look forward to your articles on less familiar wonders. Thanks for that, then! It’s a magnificent picture. My wife and I took quite a few photos, as you do, when we were at the pyramids last year, but didn’t manage to get any without a lot of tourists milling about in the foreground. Typographic note: fractional metres take the plural, so “.9 meters”, not “.9 meter”. Although I had books on the pyramids as a child, I have never much followed up on my early interest in scholarship regarding the ancient world. I am very much looking forward to the next installments of this series, and indeed the things this blog may focus on in the future. I am especially eager for you to get into the actual ancient history – while reception and the history of scholarship itself is fascinating enough, I long to read more about the people who actually went out to build those stupendous things in the desert. Sure, I could read up on that elsewhere. But I’m looking forward to reading it in your voice, as I’ve very much come to enjoy filfre.net over the few months I’ve been lurking now.